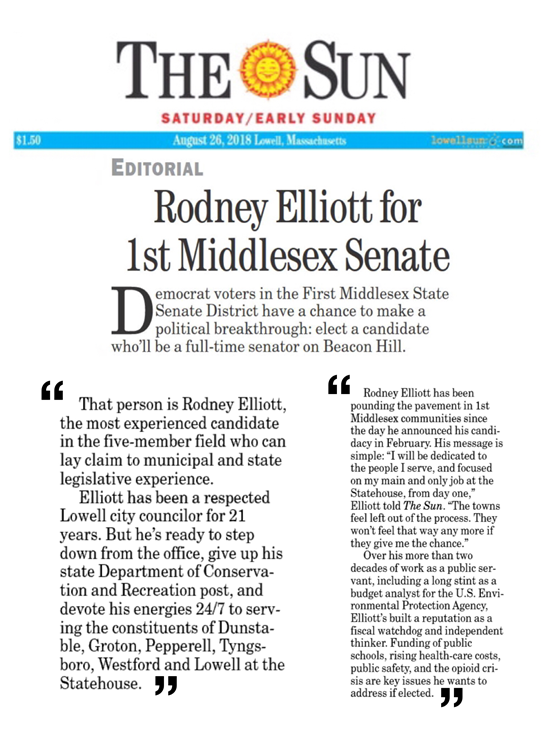 Saturday August 26, 2018: The Lowell Sun Endorses Rodney Elliott in the September 4th Primary Election for State Senate of the 1st Middlesex District. "Free the Senate seat from potential conflicts of interest for a candidate sworn to serve one constituency — the people of the 1st Middlesex." My Campaign Managers are working hard strategizing for the upcoming Primary Election on September 4th! Here is an exclusive look into headquarters! I am pleased to announce my candidacy for the Massachusetts State Senate in the First Middlesex District. For the past 21 years, I have dedicated my time and effort to making Lowell a better place to live, work, and raise a family. 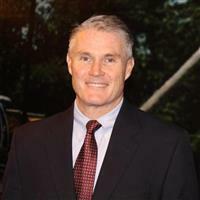 I was born in Lowell and raised my family in Pawtucketville along with my wife, Laurie (Machado) Elliott. I have two daughters, one of which is a Registered Nurse and the other is completing her degree in nursing. My son in law is a police officer. I am also the proud grandparent of three granddaughters. I am a lifelong Democrat and was raised by working class parents, whose grandparents worked in the mills of Lowell. As a City Councilor for the City of Lowell, my focus has been on municipal finance, keeping taxes affordable and cutting wasteful spending. I have always been an advocate of public safety, funding public education, and fostering a positive climate for economic development. The ultimate goal was and remains bringing good paying jobs and revenue to the city. My campaign for the State Senate will be one driven by a person to person philosophy. I want to meet every person that I possibly can. I am going to win this campaign the old fashioned way: by going door-to door, neighborhood by neighborhood to each and every town, to let you know who I am, what I stand for, and what I will do as your State Senator. I can promise you this, no one will work or fight harder for you and this district. I have the background, education, experience and tenacity to make sure YOUR voice is heard. It has been an incredible privilege to be elected to office and to be given the opportunity to live up to promises I’ve made. One thing you can always count on with me is that you will know where I stand on the issues. If elected, I will be a full-time State Senator, who will work every day of the week and then some to serve you on Beacon Hill and in the district. I will be on Beacon Hill or in your town or city EVERY day of the week. I will not just show up during election season, or for a ribbon cutting. I will commit to regular hours in each and every community in the First Middlesex District all year long. My record speaks for itself. During the two years I was the Mayor of the City of Lowell, I attended over 700 events, which was unprecedented. I worked hard to make sure that I lived up to the special history that office carries. I made sure that every constituent request, every phone call, every complaint was responded to in a timely and professional manner. Every single one. That is the type of State Senator you will have if I am elected. That is my work ethic, that is my commitment to you and that is what I will bring to the people of the First Middlesex District. I ask that you consider voting for me on September 4th.